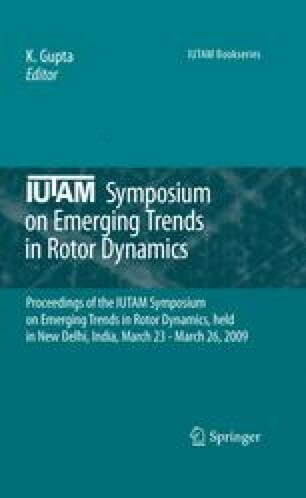 This paper presents a mathematical model to investigate the nonlinear dynamic behavior of a high speed rotor-bearing system due to surface waviness with varying number of waves. In the formulation, the contact between rolling elements and inner/outer races are considered as nonlinear springs with nonlinear damping incorporated, which is developed by correlating the contact damping force with the equivalent contact stiffness and contact deformation rate. The equations of motion are formulated using Lagrange’s equation, considering the vibration characteristics of the individual components such as inner race, outer race, rolling elements and rotor. For high speed rolling element bearing supported by a rigid balanced rotor with defective bearings, nonlinear dynamic responses are found to be associated with wave passage frequency and also with the interactive effect of wave passage and inner race frequencies (ω inner ). Results presented in the form of fast Fourier transformation are in agreement with authors’ various experimental results.